In Q3 2017, COSCO Shipping has overtaken Maersk Line by container liftings for the first time, becoming the world’s container carrier #1, informs Splash24/7 quoting the liner shipping research agency Alphaliner. The Chinese container giant COSCO Shipping, which merged with China Shipping in early 2016, reported 5.49 mln TEU of loaded volumes in the third quarter of 2017, up 23% to the same period of 2016. During January-September 2017, the company’s container shipping liftings grew even more: +30.41% to the previous year, up to 15.49 mln TEU. At the same time, Maersk Line’s volumes declined 2.5%, to 5.26 mln TEU in Q3 2017. In its quarterly report, the Danish carrier partly explains this decrease by the cyber-attack, which took place at the end of June and had a significant impact on the operations in its Transport & Logistics segment, with a financial impact of USD 250 – 300 mln, the vast majority of which related to Maersk Line. As Alphaliner reviewed only listed companies, MSC, the world’s second largest liner, was not analysed in the quarterly lifting assessment. The third place belongs, therefore, to CMA CGM with 5 mln TEU container liftings in Q3 2017, which leaves other players all down below 3 mln TEU mark. 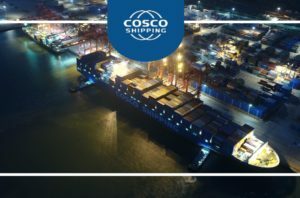 COSCO Shipping sets the goal to become a top-tier container shipping and port service provider. In July 2017, the Group offered to buy Hong Kong’s Orient Overseas International Ltd (OOIL), the parent company of OOCL container line, for USD 6.3 bln. This deal in now being assessed by regulators around the world and has already got approvals by China’s SASAC and the US anti-trust regulator. With this acquisition, COSCO Shipping, which is now #4 liner carrier by fleet capacity having 1.84 mln TEU, will increase its fleet to 2.9 mln TEU and move up to the third place leaving CMA CGM behind.